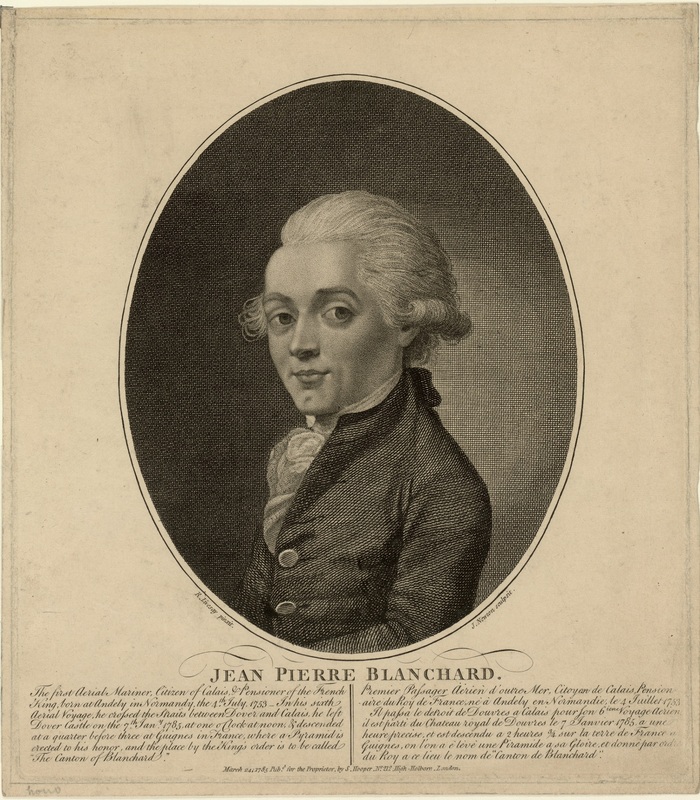 9 January 1793: At approximately 10:00 a.m., Jean-Pierre François Blanchard ascended from the courtyard of the Walnut Street jail in Philadelphia, Pennsylvania, aboard a hydrogen-filled silk balloon. Aboard were various scientific instruments and a small dog. Blanchard has sold tickets for viewing the balloon launch, and many people were present, including George Washington, who provided Messr. Blanchard with a letter of introduction. The celebrated aeronaut made his 45th voyage in a magnificent balloon, from the Priſon court of the city of Philadelphia, the 9th inſt. amidſt the acclamations of an immenſe concourſe of ſpectators. His aſcencion was majeſtick; he ſaluted his terreſtial gazers with his flag, and appeared to be as much elated, as he was elevated. At the moment in time when THE PRESIDENT arrived, to be preſent at the inflation of the the baloon, 15 rounds were fired by Capt. Fiſher‘s artillery; two cannon were fired every quarter hour until Mr. B. aſcended, when he was ſaluted with a federal diſcharge. At the date of our accounts, he had not deſcended; and it was impoſſible for anyone to ſay in what direction his car would move; or where he would land. If the wind in the upper atmosphere was fair, he was expected to arrive at New-York at night — The citizens of which place were on the look-out for this unusual viſitant. — Columbian Centinel, Boston, Saturday, 19 January 1793, Page 2, Column 4. The “aerostat” and its passengers rose to an altitude of approximately “200 fathoms” (600 feet, 183 meters) and drifted to the southeast with the air currents. 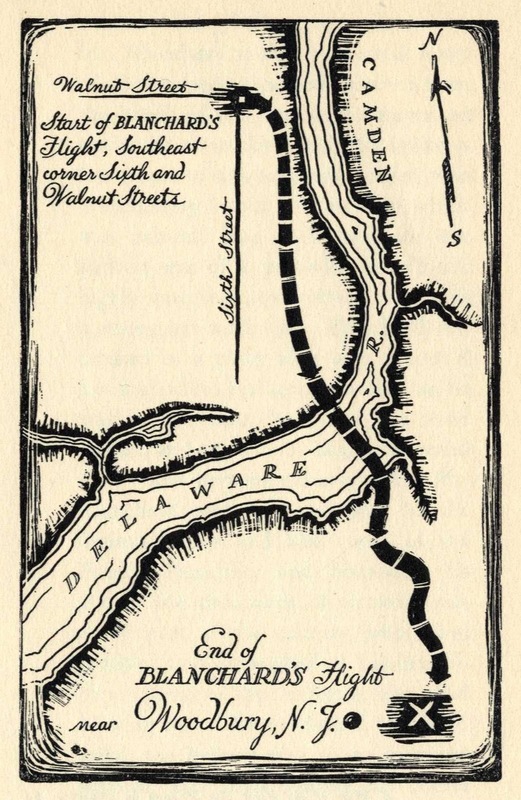 After 46 minutes of flight, Blanchard and his balloon alighted near the village of Deptford, Gloucester County, New Jersey. 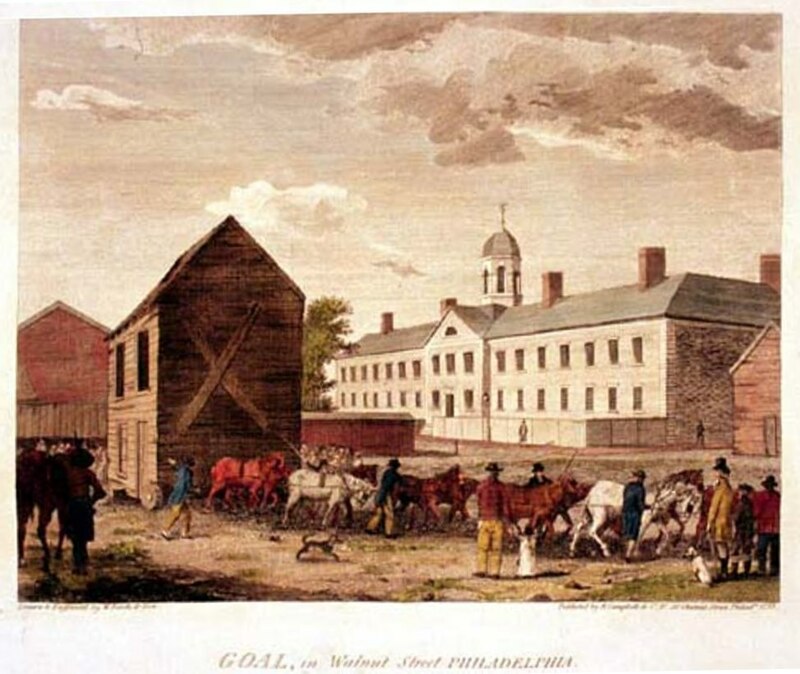 Though he spoke no English, Blanchard was able to have some local farmers help him return to Philadelphia. Shortly thereafter, he returned to France. The approximate route of travel of Jean-Pierre Blanchard’s balloon, 9 January 1793.